There is a wide variety of cheeses. 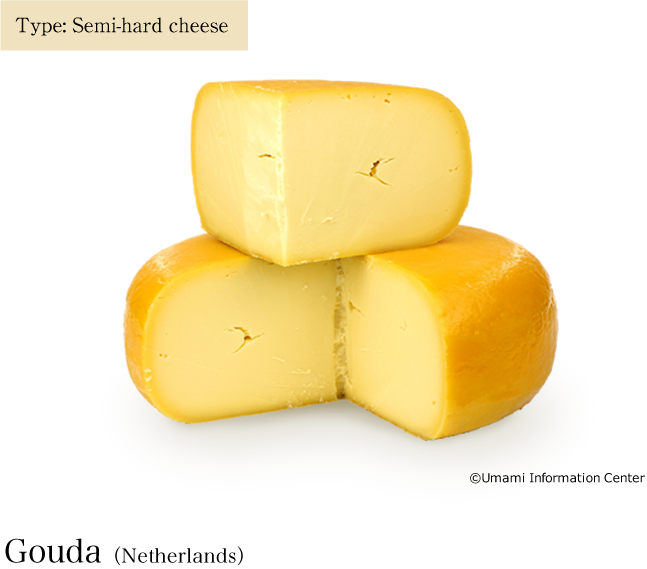 In order to research the umami in cheese, we analyzed some well-known cheeses to all over the world. This traditional cheese from Southern Italy, made with buffalo milk, has become popular the world over. As a result, similar styles of cheese are now produced worldwide. Its quality is defined by its freshness. It has a chewy and moist texture: as you bite, its sweet-smelling sweet milk flavor. 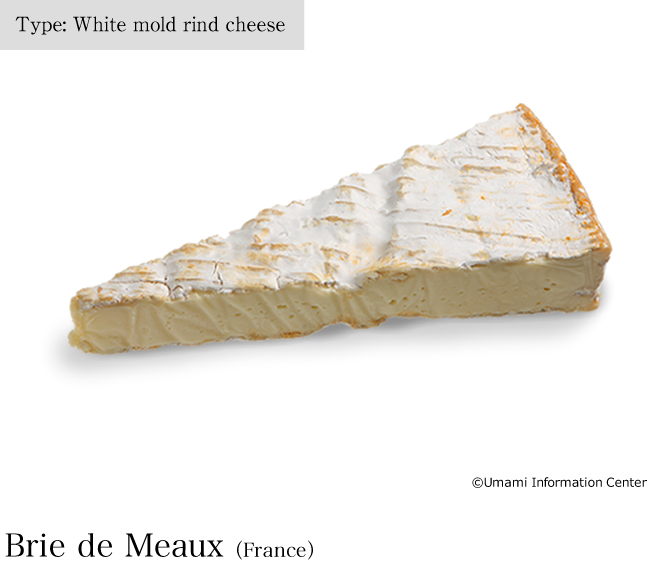 Native to the fertile Paris Basin between the River Seine and the River Marne, it is the largest of the white mold rind cheeses. It has an elegant and delicate yet strong character, with a deeply aromatic taste. 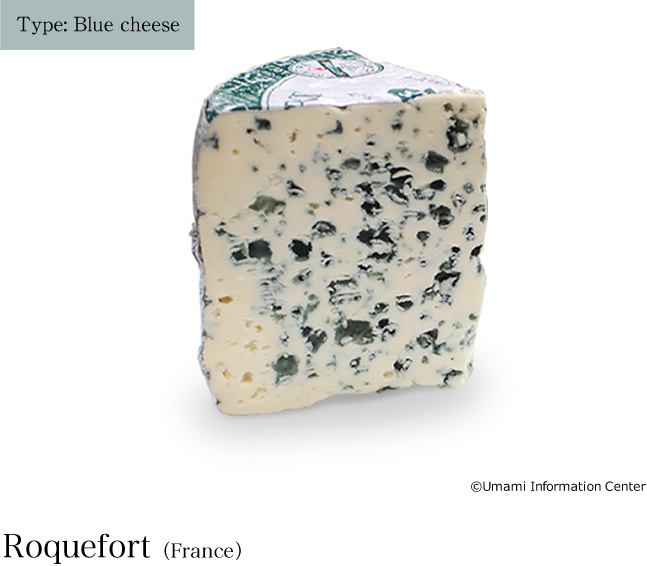 Known by its distinctive log-like cylindrical shape, spots of blue mold can be seen all over this dense cheese. 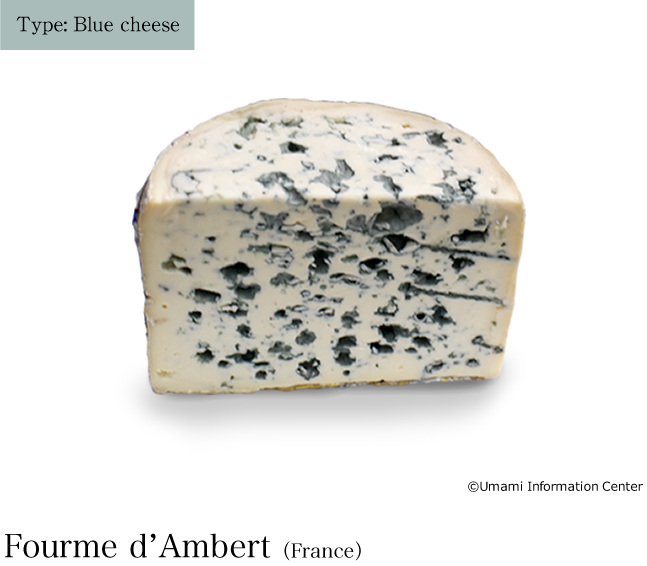 It has a mild aroma and a less ‘metallic’ sharpness than other blue cheeses. 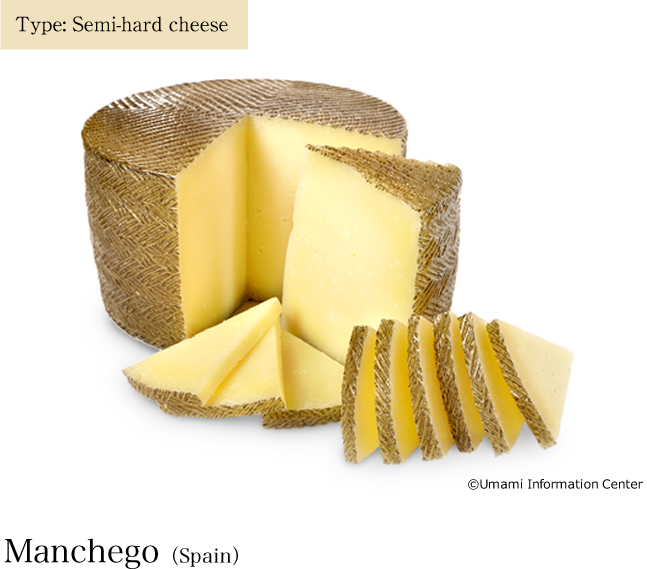 The creamy and sweet white body shot through with piquant blue mould produces a very well-balanced cheese. This sheep’s milk cheese has a 2,000 year history and has been protected by generations of French Kings. Its taste is a combination of high saltiness, creaminess, and the sweetness of sheep-milk butter. It is a cheese with a sharp and robust character. Made with three kinds of milk - cow, goat, and sheep - and penetrated by natural blue mould, it is aged in caves in the Picos de Europa mountains in Northern Spain. 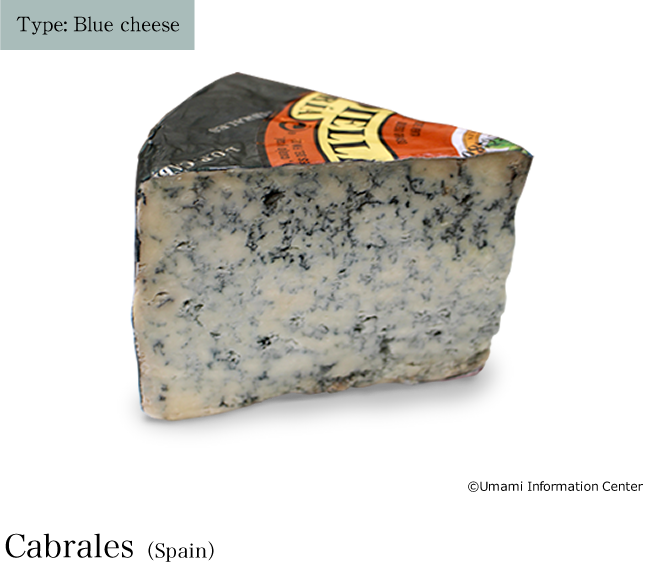 Mature Cabrales has a pungent smell and deep, rich taste. 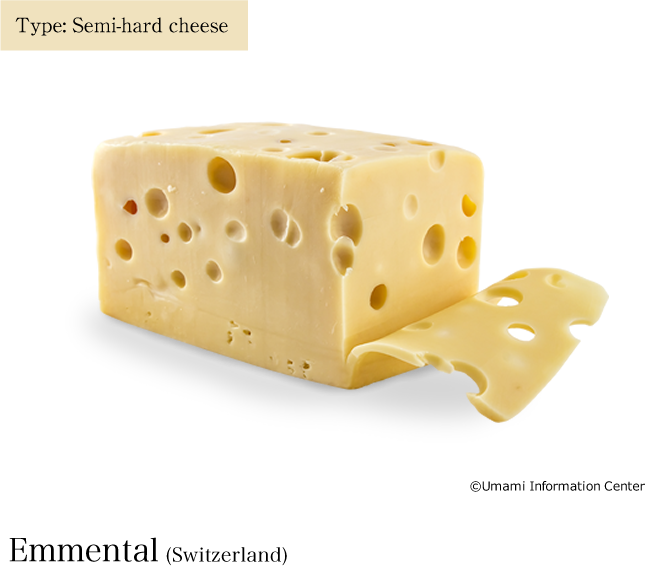 This is the classic Swiss cheese, full of holes. It contains less salt than other cheeses and has a mellow flavor with a slight sweetness, and scent of walnut. This cheese melts and stretches when heated, and is often used for hot dishes such as gratin. Another sheep’s milk cheese, this is from the La Mancha region of Central Spain, made famous by Don Quixote. 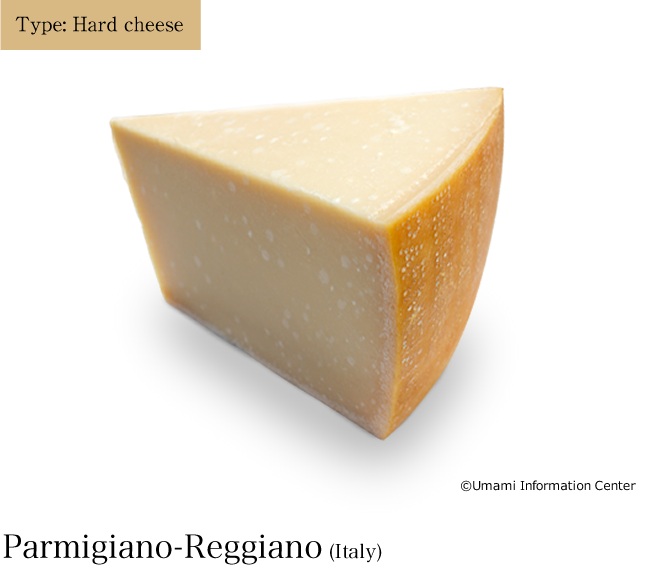 It is sold in various stages of maturity: a six month old cheese has a faint sweetness, but by nine months the cheese develops a rich, nutty flavor. A cheese that represents the Netherlands. Young Gouda tastes like mild, freshly-churned butter, but with age it acquires the tartness of caramelised sugar, reminiscent of fudge or treacle. Cheddar cheese originated in England but has spread throughout the world with the English diaspora. It is most commonly found cut into rectangular blocks, but traditionally it has a cylindrical shape. Mature Cheddar which has been aged for more than 14 months is very rich in umami flavor and has a complex and satisfying lingering aftertaste. 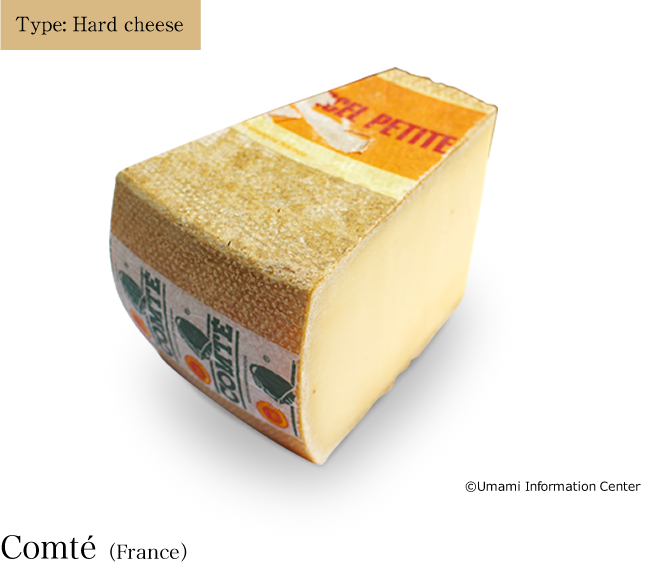 Produced in the Franche-Comte region of the Swiss-French border, this is the world’s most produced and popular cheese. Slow ageing creates complicated and wonderful flavours and aromas: hazelnuts, chocolate, caramel, chestnuts and coffee can all be detected in Comte. Parmigiano-Reggiano is widely regarded as the King of Cheese. Ageing for two to three years produces a rind browned like burnt sugar. Amino acid crystals form in the body of the cheese and create a gritty texture. Flaked, ground, or powdered, it is an essential ingredient in many dishes. Cistercian monks taught the villagers of Epoisses in Burgundy how to make this cheese. 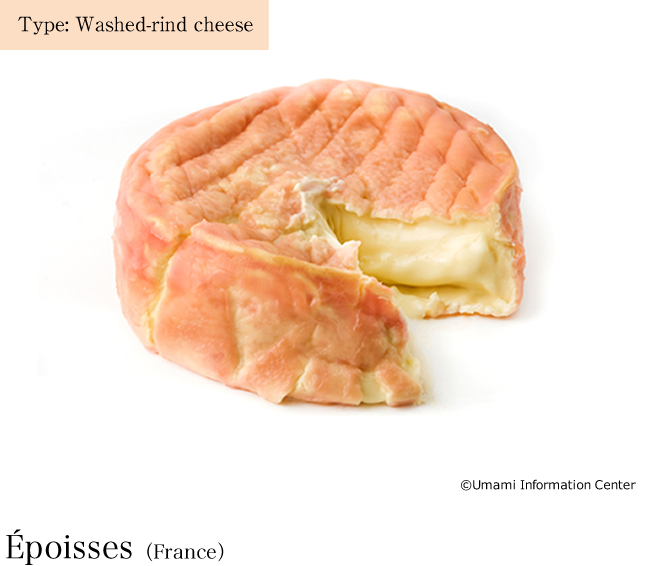 Its rind is washed with a liquor made from wine diluted with water, and finished off with spirits. 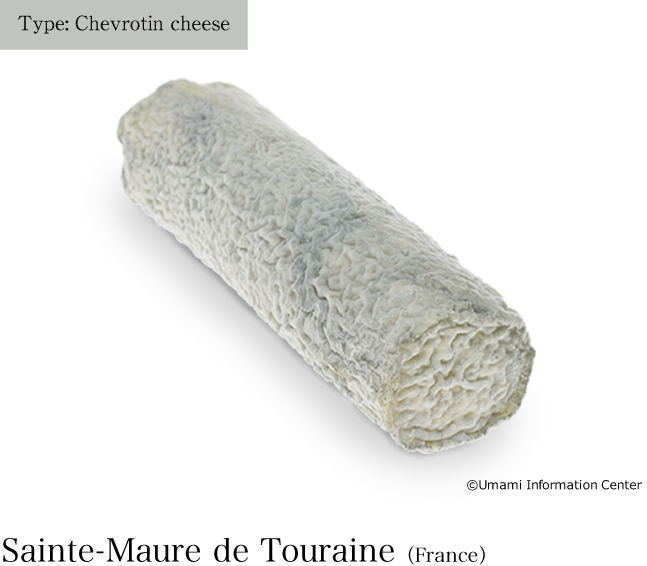 Its texture is soft and viscous, and its powerful yet delicate taste impresses any cheese connoisseur. A baton-type cheese with a single straw passed through its center for reinforcement and aeration. It is coated in edible charcoal powder to neutralize acidity, and to dehydrate and harden the cheese. Every stage of its maturity is enjoyable. There are two types of amino acids contained in food. One is a constituent of protein, the other is in a mobile state called free amino acid. Proteins do not have any flavor but free amino acids each have their own unique taste. Cheese is made from milk. During aging, enzyme decomposes the milk protein into the free amino acids that play such an important role in the taste of cheese. For example, the combination of amino acids which can impart a sweet taste (proline, alanine, glycine, threonine, serine ) and amino acids which can impart a bitter taste (valine, leucine, isoleucine, phenylalanine, tyrosine, histidine, lysine) plus an amino acid glutamate which imparts umami create the distinctive taste of Emmental cheese. Long maturation enables more of the milk protein to decompose into amino acids. Parmigiano-Reggiano is matured for over two years. As its moisture content reduces to about 15%, its free amino acid and salt content both become condensed. About 1.6% of Parmigiano-Reggiano is glutamate, the free amino acid which produces the umami taste. Hard cheeses with a balanced taste between umami and saltiness are widely used in powdered or grated forms as a seasoning in cooking. White crystals can often be seen on the surface of Parmigiano-Reggiano. They are the crystallized amino acids valine, leucine, and isoleucine, which are hardly soluble in water. They are also difficult to dissolve in saliva, and are responsible for the gritty texture. 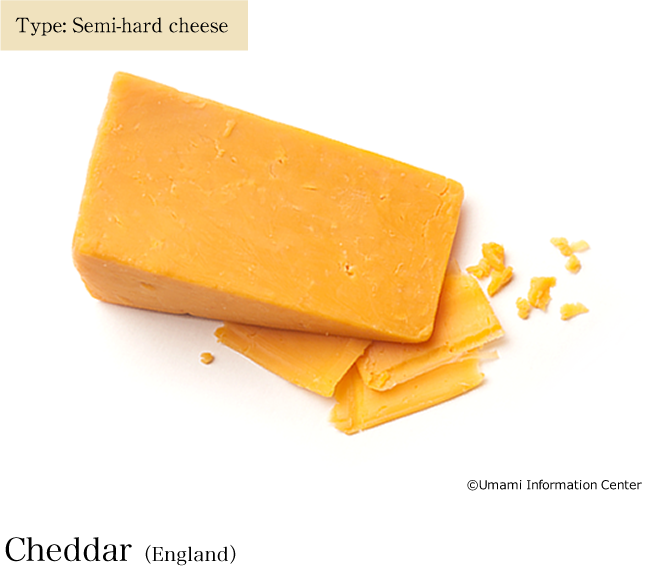 Cheddar cheese also has a long maturation period, but its surface is covered with wax during ripening and its moisture content stays at about 35%, more than that of a hard cheese. 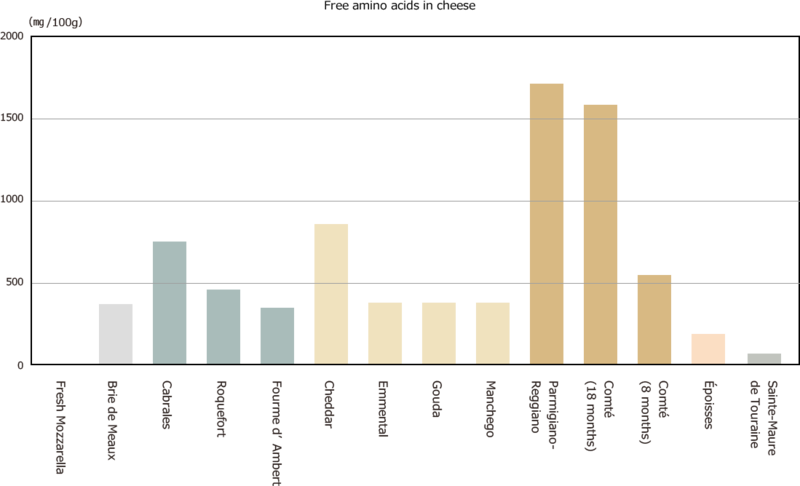 Its free amino acids are not as concentrated as those in Parmigiano-Reggiano. Fresh cheese is not aged and it contains a lot of moisture, about 56%. With few free amino acids it has a soft, smooth, and less fatty texture, with an aroma of fresh milk. It is no surprise that Mozzarella cheese, with its pleasant chewiness and attractive scent of cream, is often used in combination with umami-rich tomatoes to create delicious dishes. 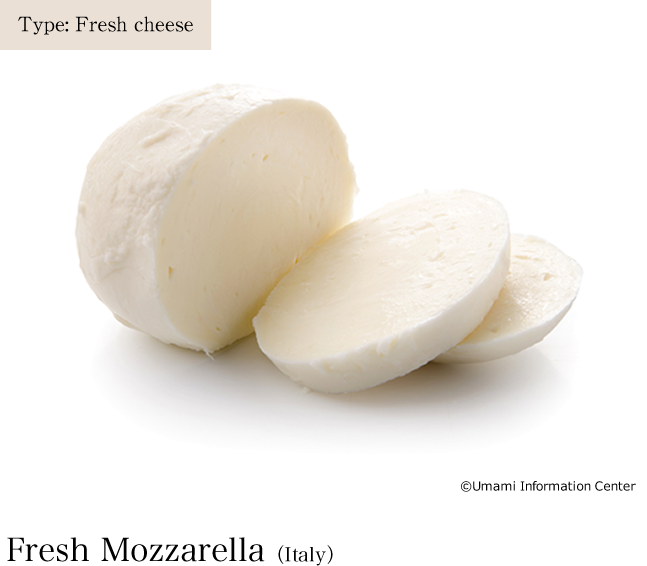 Many varieties of cheese have been analyzed for their umami content, and the results are available in the umami database. Search, and see what you find.